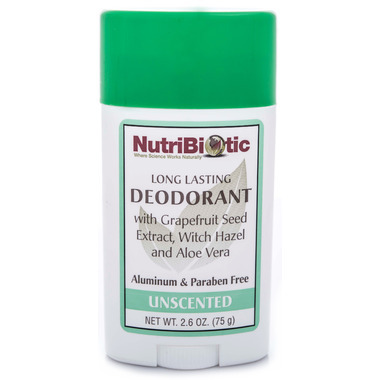 NutriBiotic Unscented Deodorant is a long lasting deodorant containing grapefruit seed extract, witch hazel, and aloe vera. Ingredients: Deionized water, propylene glycol, witch hazel distillate, sodium stearate (from palm oil), aloe vera, and grapefruit seed extract (GSE). Caution: Do not apply to broken skin. If rash develops, discontinue use of this product.